Editor/Author Cundall, Arthur E., Ellison, H. L. and Kidner, Derek, et.al. 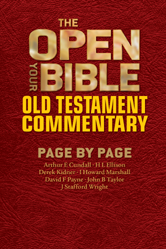 The Open Your Bible Commentary was written to encourage daily Bible study. Each reading is short, but the content is rich with careful explanation, devotional warmth, and practical relevance. Its four great strengths are that it is accessible, digestible, dependable, and practical.